SHANGHAI -- Chery Automobile, Chinas largest independent automaker, had a tough time in 2008. Sales dropped 6 percent in 2008 and cash flow nearly dried up. Now, bailed out by state-owned banks, the company plans a comeback with 15 new and redesigned models in 2009. Thats an ill-conceived plan. Chery needs a stronger brand, not more new models. Last week was the Chinese New Year holiday. I left Shanghai to see my parents in Zhenjiang, a third-tier city in east Chinas Jiangsu province. At home, I was surprised to see more Chevrolet Spark small cars than its looklike, the Chery QQ. The Spark is built by General Motors joint venture, SAIC-GM-Wuling Automobile, in south Chinas Guangxi region. 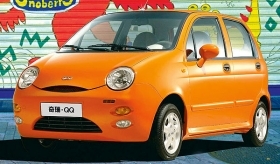 There are more Chevrolet Sparks to be seen in China (above) than the lookalike Chery QQ (below). I asked taxi drivers why more Sparks are appearing in the city. I got similar answers: Consumers trust GM more than Chery. Chery is a low-price and low-quality carmaker. How can you compare it with GM, an international company? said one taxi driver. To be sure, Chery has started spending to improve its quality. Last year, it repeatedly delayed the launch of its Chery A3 compact sedan. When the car finally debuted in October, its styling and interior looked much better than Cherys previous cars. But Chery still has a lot of brand building to do. In the meantime, Chery faces an even bigger challenge simply keeping its market share. Chinese consumers are becoming increasingly brand savvy. Global players such as GM are quickly moving downscale for more market share with competitively priced models. 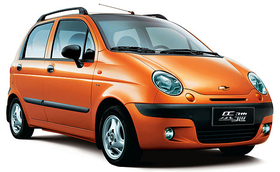 In 2008, sales of the Spark surged 25 percent to 40,800 units. By contrast, sales of the QQ dropped 5 percent to below 133,400 units, according to Automotive Resources Asia, a unit of J.D. Power and Associates. Weak brands also mean weak pricing power. The starting price of the QQ is 31,000 yuan (about 3,500), much lower than the 40,000 yuan of the Spark. A strong brand is essential to surviving in the competitive market in the long term. Chery cant afford let up its brand-building efforts. Hastily launching an array of new models is more likely to increase Cherys financial burden than ease it.